Cats and turtles figure prominently into Madeline’s Madeline. The title character, an emotionally tempestuous New York teenager looking to channel her volatile feelings into acting, likes to role-play as a feline, purring and nuzzling on anyone in her radius, and sometimes to pantomime the slow crawl of a shelled reptile, flapping her arms like flippers. But if this off-kilter, house-of-mirrors drama has a real spirit animal, it’s the ouroboros, the snake with its own tail crammed down its gullet. Which is to say that Madeline’s Madeline, the third feature from writer-director Josephine Decker, is a self-devouring thing: a movie about artistic process that doubles as a document of—and even a commentary on—its own artistic process. Decker, who’s interested in the way life and art blur into each other, has blurred those very lines herself, building a film about an improvisational actors’ workshop out of an actual improvisational actors’ workshop. Meanwhile, the potent director-star relationship that drives the project has been baked right into its loose plot. “Meta” isn’t a strong enough word for its relationship to itself. This is the kind of film, a Sundance sensation heavy on improv, that traditionally lives or dies on its acting. But Decker, whose first two features—Butter On The Latch and Thou Wast Mild And Lovely—were released simultaneously four years ago, isn’t one to simply plop down a camera and let her cast do its thing. She shoots invasively, with close-ups so extreme that they seem to slip past her actors’ facades to their porous true selves, but also creates a dreamlike atmosphere through gauzy streaks of light and brilliant smears of color. 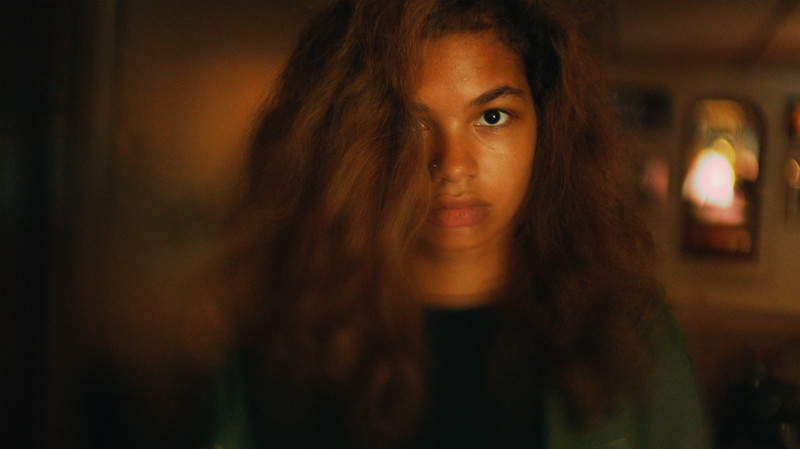 In Madeline’s Madeline, the filmmaker’s restless, sometimes claustrophobic aesthetic has been applied to a fundamentally subjective point of view: the frazzled vantage of 16-year-old Madeline (newcomer Helena Howard), fresh out of a stint in a psych ward and experimenting with the self-medication of unofficial drama therapy. That doesn’t sit easily with Madeline’s mother, Regina, who’s played by artist, author, and fellow filmmaker Miranda July (Me And You And Everyone We Know). Like plenty of parents, Regina worries endlessly about her daughter, and is fiercely protective of her. But she also can’t see past her mental illness. Stifled by her mother’s concern, Madeline is drawn to Evangeline (Molly Parker), who conversely sees a fierce, original talent in the teen. Evangeline is the director of an “immersive theater” piece that seems, like the play-in-endless-progress of Charlie Kaufman’s Synecdoche, New York, to be in a constant state of preparation and reinvention. Will it ever evolve into an actual work? Decker includes numerous scenes of the troupe’s mostly unnamed performers going through vocal and motion exercises, gyrating around the set to express whatever abstract concept they’re tackling that day. (“Is this a metaphor?” becomes a regular question posed to Evangeline; the answer is almost always no.) This may look familiar to anyone who’s experienced the workshop digressions of a Jacques Rivette movie—or, for that matter, anyone who’s spent some time of their own in a less-than-structured backstage environment. At times a viewer may feel as exasperated as Regina does with the freeform (drum) circle jerk of the rehearsals. But the performances hold the center, and our interest. Howard, who Decker met at a theater festival, is a real find. She has an almost feral intensity, a mix of uninhibited expression and vulnerability that only the brightest young talents locate. And she seems to possess a direct line to her emotions, which she can turn on and off like a tap. All of this could be said, too, about her character, which may be the point. Is Evangeline, who begins to reshape her project around Madeline’s tumultuous relationship with her mother (undermining Regina in the process), exploiting her new star’s mental-health issues? Is there an element of exploitation to all director-actor creative bonds, or at least to the ones that demand personal investment from the latter, even when mental illness isn’t involved? It’s hard not to read Madeline’s Madeline as self-implicating: a filmmaker not just seriously questioning the value of exorcising demons through art, but also (auto) critiquing the collaborators who might twist that process for their own purposes. “You’re going to tell the story of the inside of her brain?” one of the other performers asks Evangeline, doubt on her breath. It’s a question that Decker might well be asking herself, given how much her choices—first-person point of view, shallow depth of field, a soundtrack that warps in moments of stress or duress—seem designed to put us right into someone else’s frazzled, disturbed headspace. But Decker’s fragmentary style can be undeniably arresting; with just a slight modulation of tone, she could make a killer psychological thriller, something on the Repulsion terrors-of-the-mind spectrum. Here, she seems to have constructed an echo chamber for her own artistic anxieties. You may get the sense, as one does with most relentlessly self-examining works, that Madeline’s Madeline is really just about itself—and, perhaps, that it will mean the most to those who made it. Decker has real vision. It’s exciting to imagine her turning it on something other than her own process.